With the Bransonic® CPX, we’ve gone digital and defined a new category in ultrasonic baths. We’ve reimagined our iconic line of ultrasonic baths for total control with a fully digital Tower Control Panel. The CPX also features our new self-adaptive technology that actively tracks and adapts to changes within the bath. 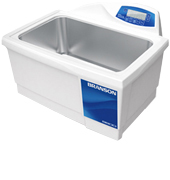 All Bransonic® baths can also be used for cell separation, sample preparation and degassing of liquids. 150743-30 ULTRASONIC CLEANER, DIG, 0.5 GAL,120V .5 gal 9.9" x 12" x 11.9"
150743-32 ULTRASONIC CLEANER, DIG, 0.75 GAL,120V .75 gal 13.3" x 12" x 11.9"
150743-34 ULTRASONIC CLEANER, DIG, 1.5 GAL,120V 1.5 gal 15.6" x 12.5" x 14.8"
150743-36 ULTRASONIC CLEANER, DIG, 2.5 GAL,120V 2.5 gal 15.6" x 15.8" x 14.9"
150743-38 ULTRASONIC CLEANER, DIG, 5 GAL,120V 5.5 gal 23.5" x 18.3" x 15.4"